I get a reminder most every day from someone that I have two first names. People think they are dropping knowledge on me. “Did you know you had two first names? That’s weird.” I usually respond with, “Oh, is Billy Joel weird? Is Michael Jordan weird? Is Bruce Wayne weird? You making fun of Batman, bro? Can you just give me my latte, please?" My inspiration to write is something I’ve had as far back as I can remember. In one form or another, I’ve always been writing. When I was about 5 I wrote a song called “Pocket Pants” that my mom loved. It was an ode to my favorite article of clothing. In middle school, I wrote parody songs, and in high school, I started writing original comedy songs. I wasn’t handsome enough to get noticed by girls, so comedy gave me a chance to stand out and get a reaction. Writing evolved for me into writing blogs for a while, and then I felt a challenge from God to write a book. Part of writing for me is probably the fact that I am the younger brother of an older sister, and I had to fight my whole life just to get a word in. Writing lets me now say as much as I want. One nice thing about not having to write for a living is I get to choose what I write about. So I write about what stirs me up emotionally and spiritually. I write a lot about what I struggle with. I don’t learn well from teachers who aren’t learning, so I feel like sharing shortcomings and failures is an open door to connecting with others who are right there with me. Once I know what I want my chapter’s (or blog, or any message) overall point to be, I then write down two bullet points: “Start. Finish.” After Finish I write the main point I want to be taken away from the chapter. What is the point I want the reader to know at the end? Usually, I write the Finish goal first because it’s the message of the chapter.” After Start, I write where I want to begin, which for me is normally an analogy or a story that becomes an analogy of what the chapter is going to discuss. From there, I fill in the gaps in between and the outline grows. I weave out a path to get from start to finish. It sounds stupidly simple, but so many of us writers will just start writing and basically puke all of our thoughts onto paper, and then go and filter through it all and see if there is anything in there, which isn’t the worst idea if you’re brainstorming. But if you can identify a route through and to your message right at the start, it will make a huge difference. My resource of choice is Google Docs. I can’t live without Google, and Google Docs is the very best tool that has ever been given to anyone working on a writing project. It makes editing so much easier when you’re not sending around a Word doc that gets saved a million different times. Everyone who is looking at your writing is looking at the same Google Doc. Editing is so easy with comments and any changes someone makes. And most important of all – it always AutoSaves! I used to be a big fan of Evernote, but I’ve found they do not let you export out easily. I had tons of notes for my book I’m working on now and was so depressed when I found out I couldn’t export them into Google Docs or Word. I had to manually copy and paste them all. Evernote is like the Mob—they don’t make it easy for you to get out. My biggest challenge is a good question, and I could write about challenges for a long time. The challenge I’ll choose to comment on, though, is finding the time to write. Before I started working on my first book, I was never a morning person. I thought waking up at 7:30 am was early. I’d try and write at night and would get lost in the events of the evening or I’d just be tired. When I started working on the book, I started getting up at 6:00 am to write. I didn’t realize I could be productive in the morning. I thought my brain wouldn’t be powered up, but I was so wrong. Through the power of coffee, which I never used to drink in the mornings, I can knock out a few hours of writing before work gets started. Then at night, I don’t have to worry about writing over spending time with my wife. I used to feel guilty if I didn’t write and was watching TV instead. Now it’s done in the morning, and if I have extra time in a day I can write then that’s a bonus win. Everyone has to find what works for them, and this has been what works for me. I now think if I wake up at 7:30 am I have missed my morning. Even if I don’t write a ton, I really just love being up earlier and getting a start to my day that isn’t immediately flying into work mode. I guess my biggest strength is my sense of humor. And I say that at the risk of being the guy who tells you he’s funny and he isn’t at all and it’s just super awkward. It’s embarrassing for me to say it, but I do think it’s my strength. Allow me to elaborate. “Shoot the ball! I put you in the game to shoot the ball!” And so I’d keep shooting and usually, I’d start hitting some shots. I think with our strengths, we tend to lean away from them. It’s embarrassing to say, “I’m good at [this],” which is actually not humility, it is pride. We’re too proud to say we’re good at something because we might fail at it. And when we lean away from our strengths, we start trying to be someone we’re not. We will always emulate our heroes, but it becomes damaging to our message when we try to actually be them. The dumbest I ever sound is when I’m trying to sound Tim Keller smart. I’m just not. First off, he’s got decades of wisdom on me, and secondly, he has an intellectual mind I’ll never have. But he’s not funny. He never makes Kirk Cameron jokes. I make tons of them. If I’m in the game to shoot the ball, which for me is to use humor to tell my message, I will only keep missing if I’m trying play like someone else. My advice for authors is “Don’t be afraid of the delete key.” Editing is painful, especially when others are editing your stuff. I was at the point of tears a few times in my book editing process, and that was with some of my closest friends editing it. It hurts, but I learned you have to let it go and not take it personally. Instead, look at it like, “These people believe in what I’m writing so much they are willing to edit this.” Don’t hold your pride above your message. That’s a reminder to myself, too. Anyone can connect with me on what is now a dumpster fire known as Twitter @JonathanTony. Instagram: @JonathanTony. Facebook.com/JonathanPTony. 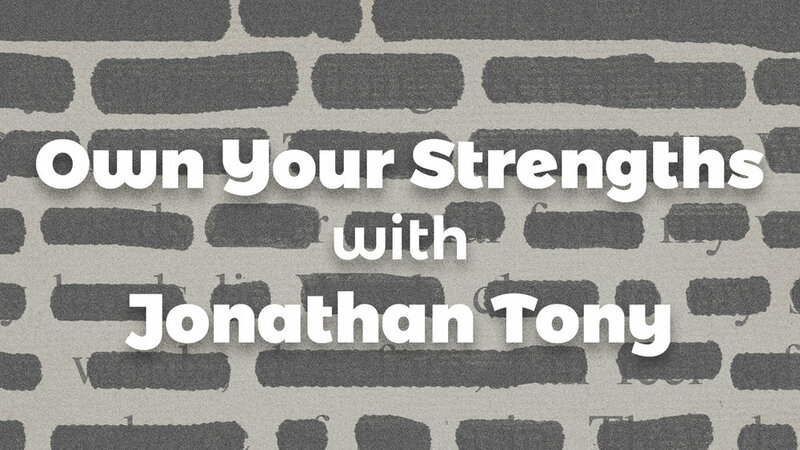 And my website, www.JonathanTony.com. I have Snapchat but I don’t know what my name is and I usually forget I have it. You can get my book, Unbalanced: Searching for Truth Between Religion and Culture in print, Kindle, or audio on Amazon. I know I say this everytime, but this interview was incredibly inspiring. From his process, which I think is incredibly effective, especially for non-fiction, to the advice about leaning into your strengths. It's all too easy to be coy about the things we're good at. It's true that we should be careful, lest we become too full of ourselves, but we have our strengths for a reason, and it's a disservice to not own them for what they are. I know there's plenty of this interview that'll be taking notes on and taking to heart. Jonathan is a great guy, and he's hilarious on Twitter. Give him a follow and brighten up that Twitter feed!